Do You Want Trump to Buy the Dodgers? Big League Stew has a story this afternoon that brings up the possibility of Donald Trump buying the Dodgers. I don't know if I'd be a fan of this. 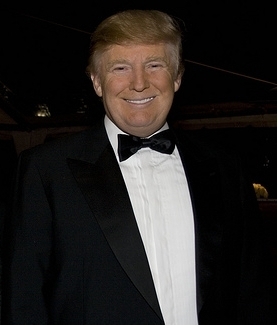 Greta Van Susteren of Fox News interviewed Donald Trump for her "On The Record" show Wednesday night, and they ended the conversation by talking about the Los Angeles Dodgers. Basically, she begged The Donald to buy them. Go to the 9:00 minute mark to hear his thoughts about buying the Dodgers. 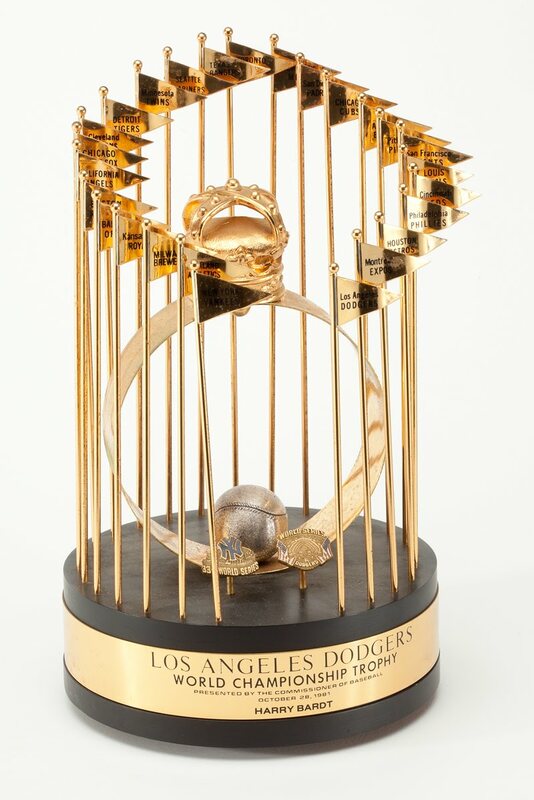 This is pretty exciting news for Dodger fans and team history buffs. Former Dodger GM Buzzie Bavasi and Dodger first baseman Gil Hodges are a part of the 10 man Golden Era Ballot for entrance into the Baseball Hall of Fame. This is for the Class of 2012 and promises to be very competitive. All 10 names on this ballot have merit. Other potential entrants include Ken Boyer, Charlie Finley, Jim Kaat, Minnie Minoso, Tony Oliva, Allie Reynolds, Ron Santo and Luis Tiant. In my mind, Buzzie Bavasi should not be overlooked here. He easily ranks as one of the most important names in Dodger lore. Often overshadowed by Branch Rickey, he was an important cog that brought about the integration of Baseball and several championships to both the Brooklyn and Los Angeles Dodgers. From 1946 to 1947 he was GM of the Nashua Dodgers which featured both Roy Campanella and Don Newcombe. Then, from 1948 to 1950 he was the GM for the Dodgers top farm club, Montreal Royals. Soon, he would join the Dodgers to be their longtime GM from 1951 through 1968. The Dodgers first, and only, World Championship in Brooklyn happened under his watch in 1955. By the time he was done leading the 'Boys in Blue' he captured 4 World Titles and 8 League Championships. Of course, his work was not done. He was instrumental in the formation of a expansion team in San Diego. Any candidate to receive votes on 75 percent of the ballots cast by the 16-member Golden Era Committee will earn election to the National Baseball Hall of Fame and will be inducted in Cooperstown on July 22, 2012, along with any electees who emerge from the 2012 Baseball Writers' Association of America election, to be announced on Jan. 9. Here are some Dodger rookies in costume courtesy of @Dodgers Twitter. LA Mayor Villaraigosa believes that the new Dodger owner should be local, via Contra Costa Times. Bill Shaikin never sleeps. He tweets more details about the McCourt/MLB agreement. Forbes speculates that the Dodgers could sell for as much as $1.5Billion. Holy Moly! Wow! Peter O'Malley appears to be interested in buying back the team, via LA Times. Evan Bladh at Opinion of Kingmans Performance puts his support behind Peter O'Malley's nephew, Tom Seidler. Former Dodger GM, Fred Claire, is also on the hunt to buy the Dodgers, via Bill Shaikin. Steve Garvey's bid buying group appears to be for real. Rumor has it that Ron Burkle may be his money man. Via Molly Knight. Tom Hoffarth does a nice historical review of the Dodgers ownership throughout the past 100+ years. Matt Kemp talks about 2011 and the Day of Champions event this coming Sunday in benefit of the Bogart Pediatric Cancer Research Program. SCP is currently running a major auction that includes memorabilia directly from Julius "Dr. J" Erving. So, if your a big basketball fan I suggest checking them out. 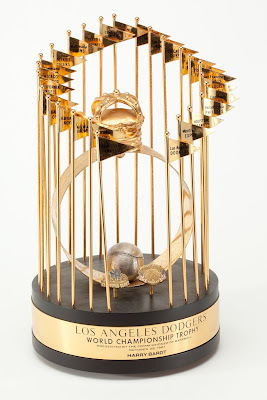 On the Dodger front are a couple of great trophies any Dodger fan would love to get their hands on. They once belonged to Harry M. Bardt. Harry M. Bardt was a member of the Los Angeles Dodgers Board of Directors, beginning in 1967 and also served as the Dodger's treasurer from 1975 to 1980. He began his career with Bank of America in 1928 and as executive vice president he was instrumental in launching BankAmericard in the 1950's. Below is his 1981 World Series trophy commemorating the Dodgers championship win over the Yankees. 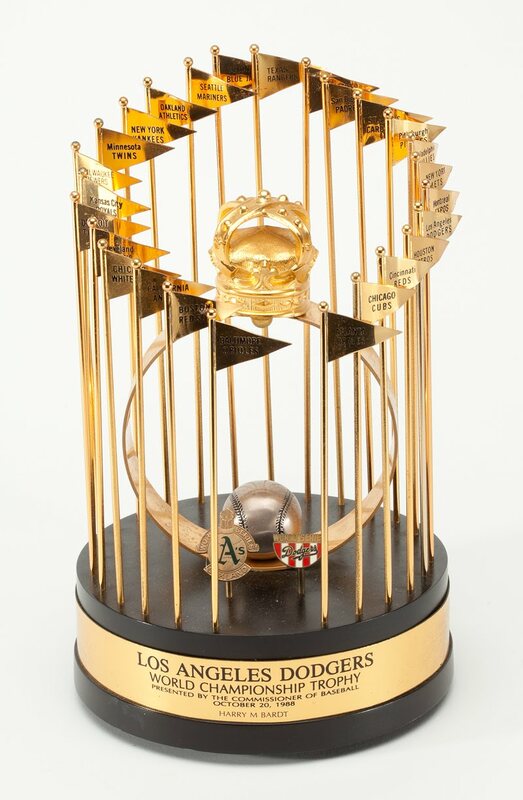 This is Bardt's 1988 World Series trophy. This is probably the coolest of all vintage southland area jersey's. 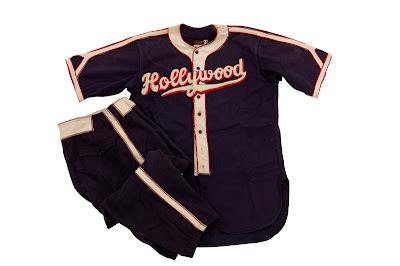 Here is a 1941 Hollywood Stars jersey once worn by Hiram G. Bithorn. Bithorn is Puerto Rico's most famous player. This 1941 Hollywood Stars jersey, from one of Puerto Rico's most revered players, is the only one known to exist in the hobby to date. The jersey is unaltered and has a Wilson tag in the collar with a size 44 tag...Tragically Bithorn would be killed at the early age of 35 on New Years day in 1952. The people of Puerto Rico honored him in 1962 by having the country's largest baseball stadium named after him - Estadio Hiram Bithorn.